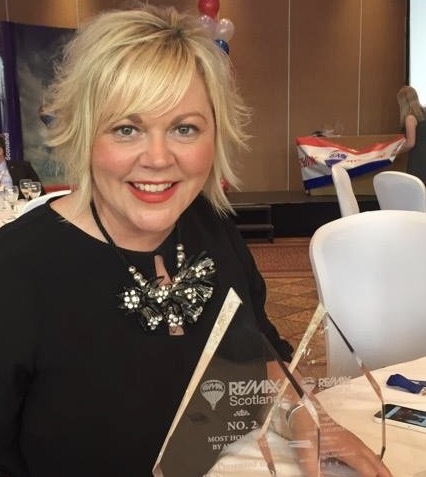 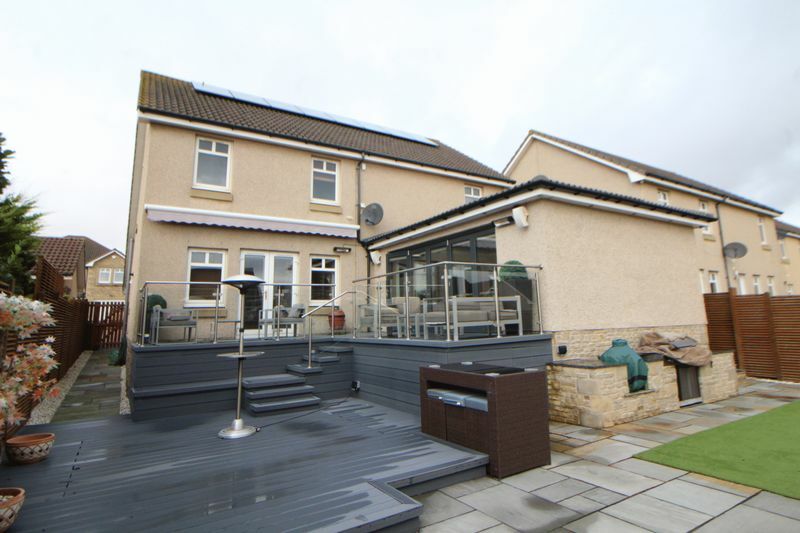 Susan Morton at RE/MAX is delighted to market this extended Abbotshall Homes detached family villa with partial sea views to the upper rear. 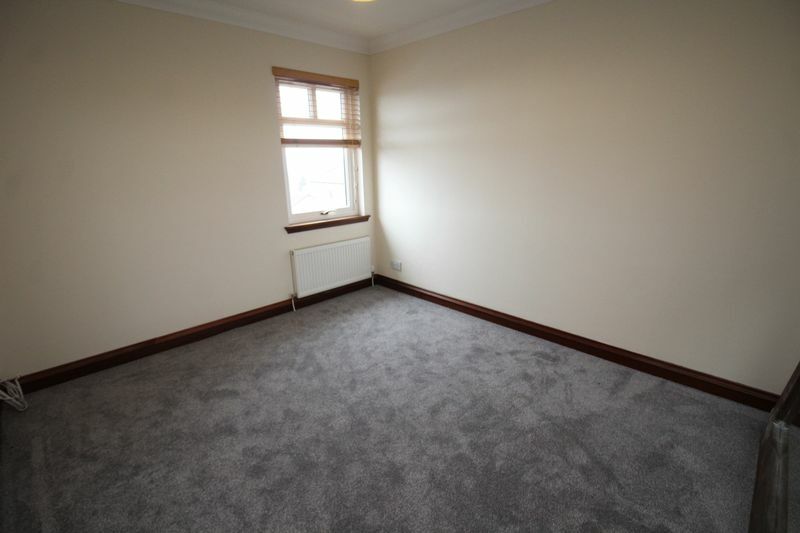 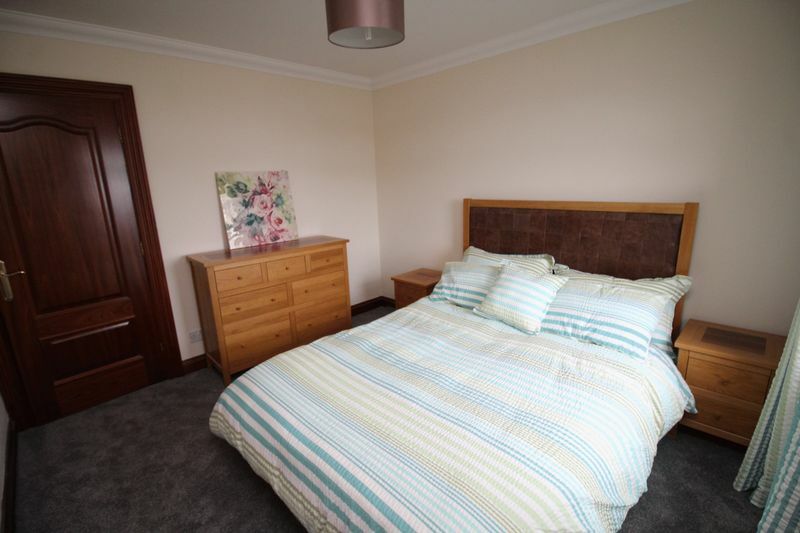 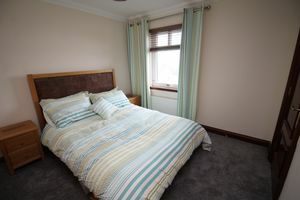 Located within the Seafield Towers development, just a short walk from the foreshore and town centre, and lying within the West Primary School and Balwearie High School catchment area. Comprising: vestibule, hallway, spacious lounge, stunning open plan dining/kitchen/family room (45’ x 14’) with appliances and utility, master bedroom with French doors leading to the garden and with en suite shower room, 4 further bedrooms (one with dressing area and en suite shower room) and family bathroom. 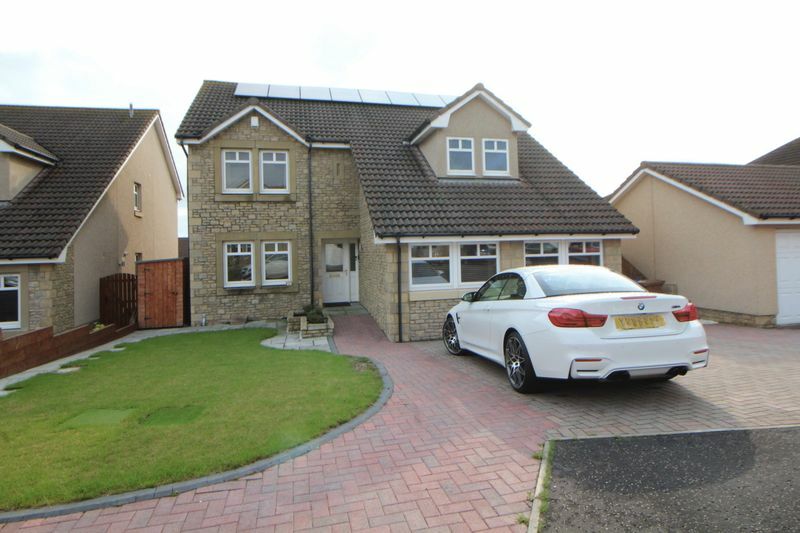 Gas central heating, double glazing, alarm system, built-in sound system, solar panels generating an income, hardwood doors and finishing throughout. Garden ground with decked seating areas and mono blocked driveway for several cars. Viewing highly recommended. Entrance to the property is over a mono-blocked driveway/pathway leading to the main door with an opaque glazed panel and co-ordinating side screen which opens into the vestibule. 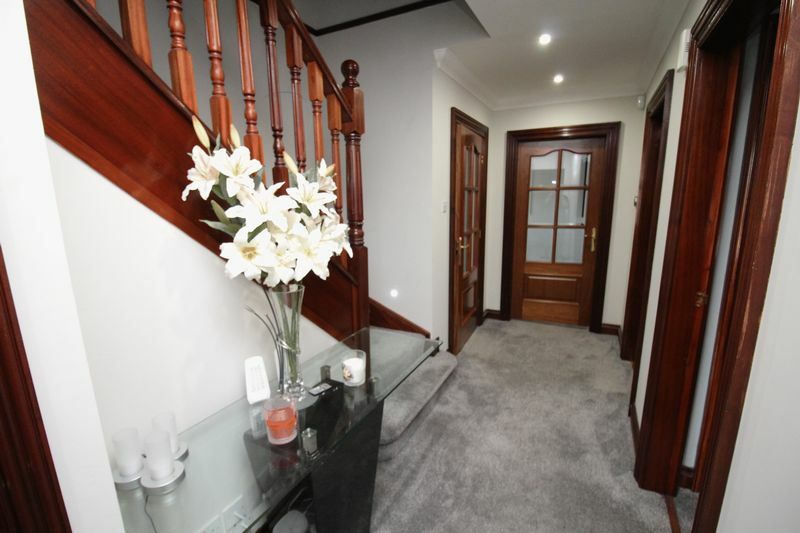 The vestibule allows access into the hallway via six paned door. 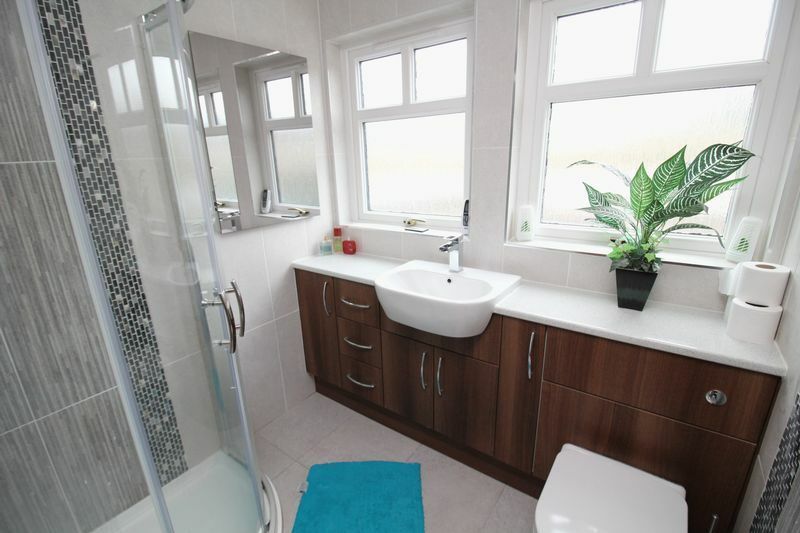 Tiled floor, coved ceiling with LED down lighting, radiator and alarm control panel. 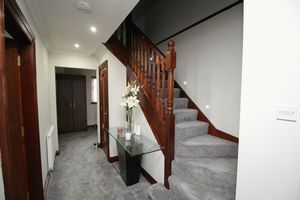 The hallway with side facing opaque glazed window allows access into the lounge, open plan dining/kitchen/family room, bedroom 1, shower room and incorporates the staircase leading to the upper level and a built-in under stair cupboard which also houses the electric meter. Fitted carpet, LED down lighting, two radiators, telephone point, hardwired smoke detector and ample power points. 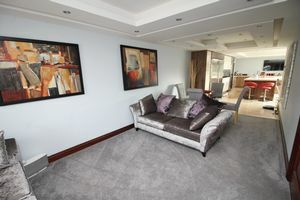 The spacious lounge features four front facing windows and has ample space for furniture. Fitted carpet, LED down lighting, projector with screen, built-in sound system speakers, three radiators and ample power points. 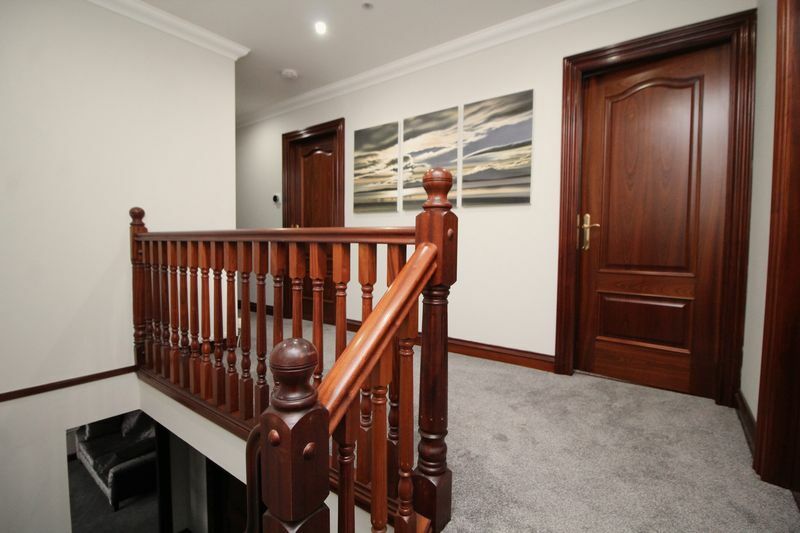 Double six paned doors leading into the hallway. 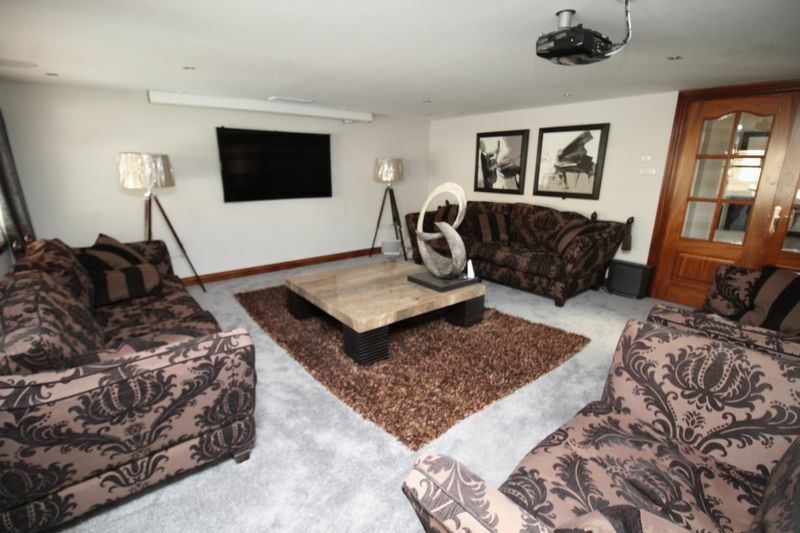 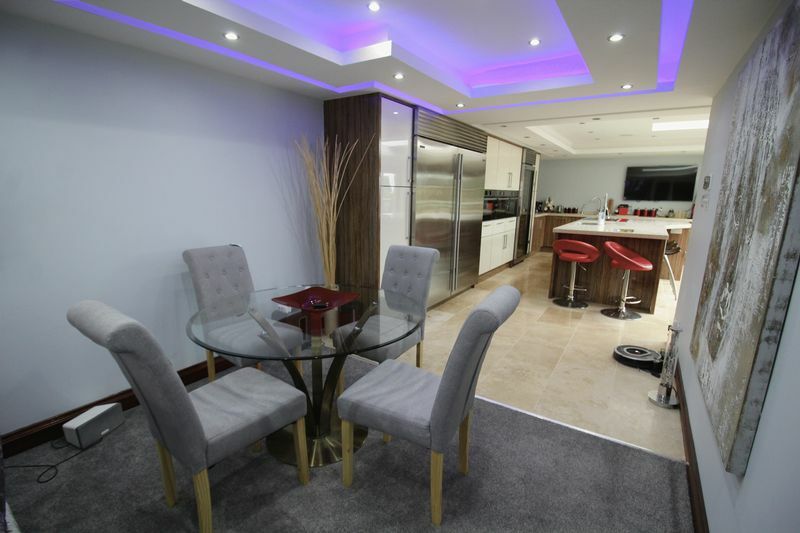 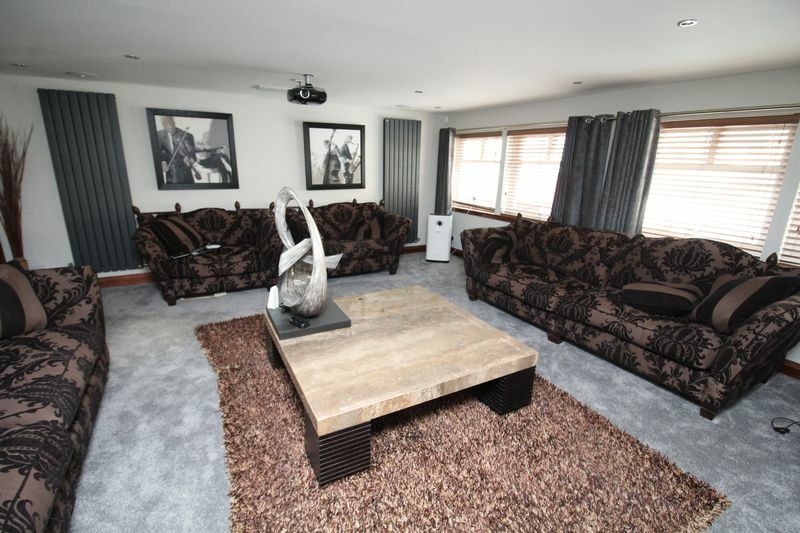 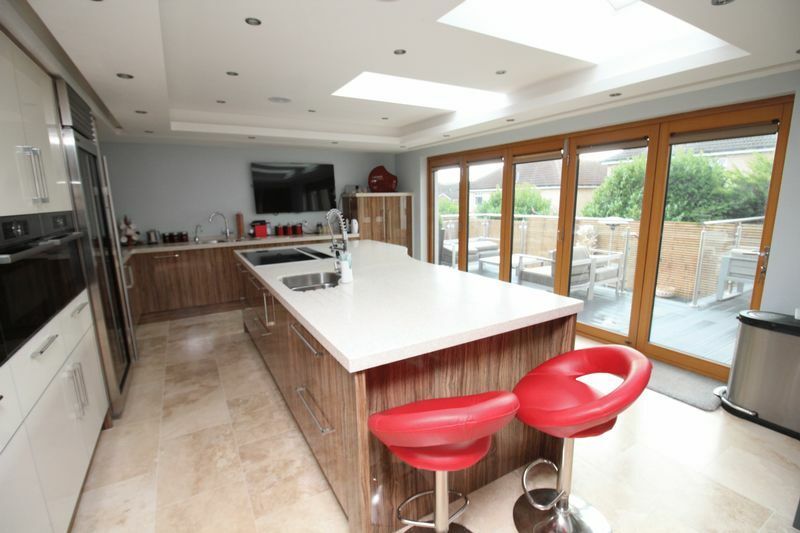 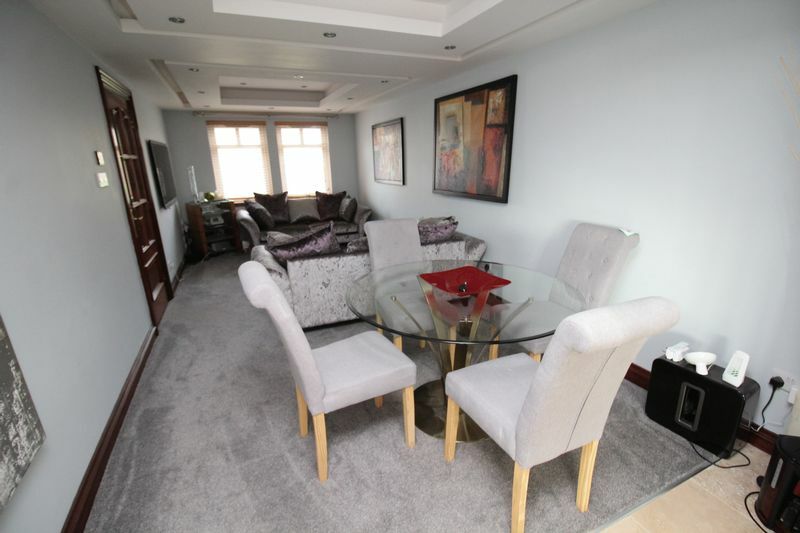 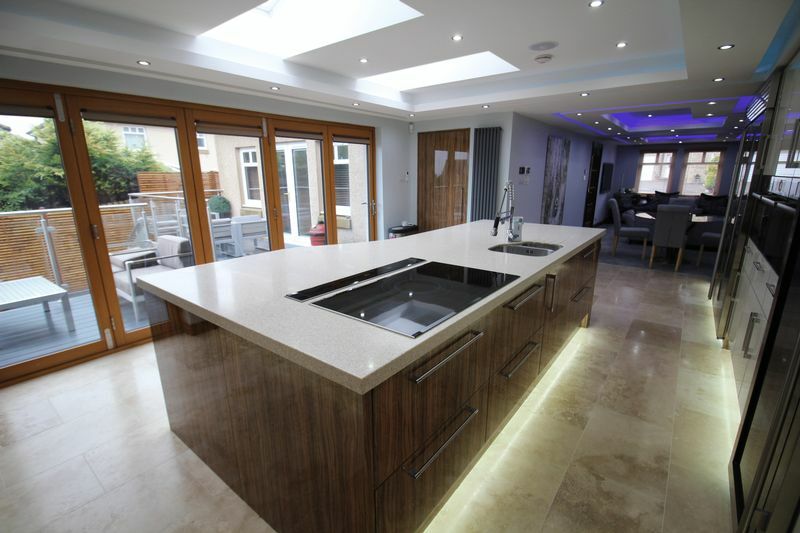 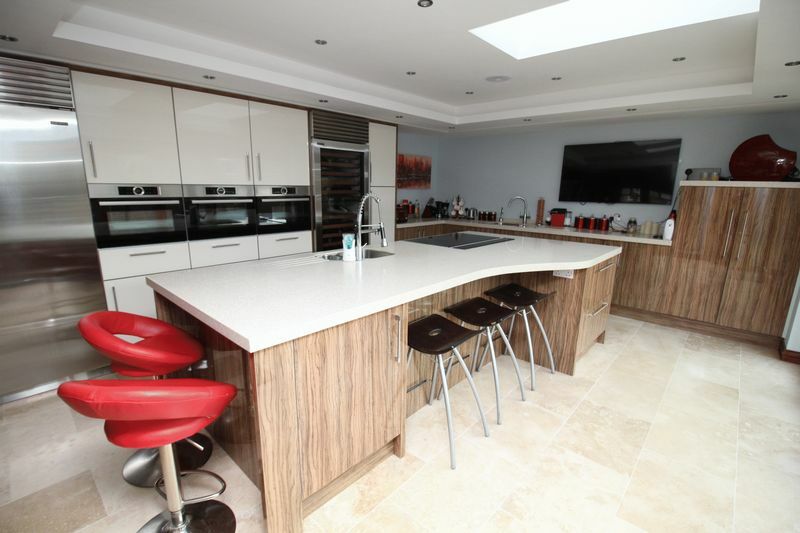 This open plan room has been extended and refurbished to an extremely high standard, features two front facing windows, two Velux windows, bi-folding doors opening out onto a decked seating area within the rear garden. 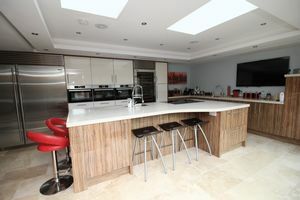 Incorporating both wall and floor mounted units with central island, three built-in Bosch ovens and induction hob with Neff downdraft extractor fan, built-in Sub Zero 36” each fridge and freezer, Sub Zero dual zone 146 bottle wine chiller, Corian worktops and two sinks, one with QETTLE instant hot/boiling water and cold filtered drinking water. Fitted carpet to dining and family area and tiled floor to kitchen area, coved Georgian style ceilings with LED controlled down lighting and built-in sound system speakers, LED kick plate strip lighting and under worktop lighting, hard wired heat detector, radiator and under floor heating, tv point, Nest Learning central heating thermostat and ample power points, some with USB chargers. Built-in utility cupboard with wall mounted units, work surface with built-in space below for washing machine and dishwasher, tiled floor and two ceiling down lights. 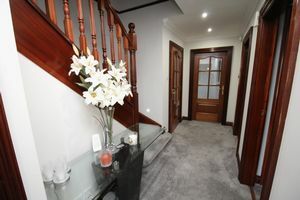 Door leading into the hallway. 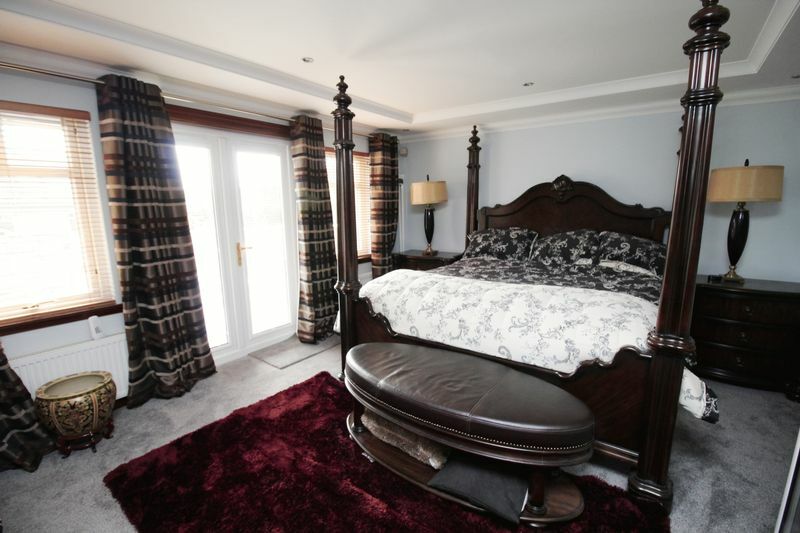 This bedroom features two rear facing windows, French doors leading out into the decked seating area within the rear garden and a built-in double wardrobe. 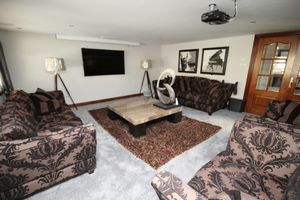 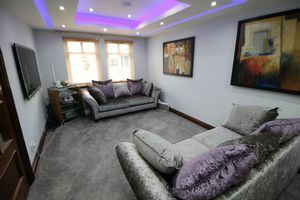 Fitted carpet, coved Georgian ceiling with LED down lighting, two radiators, tv point, wall mounted sound system speakers and ample power points. 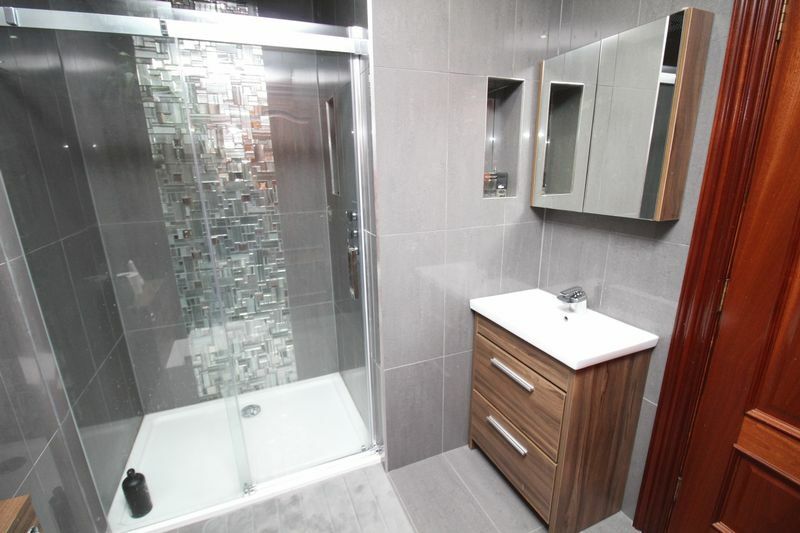 Doors leading into the hallway and en suite shower room. 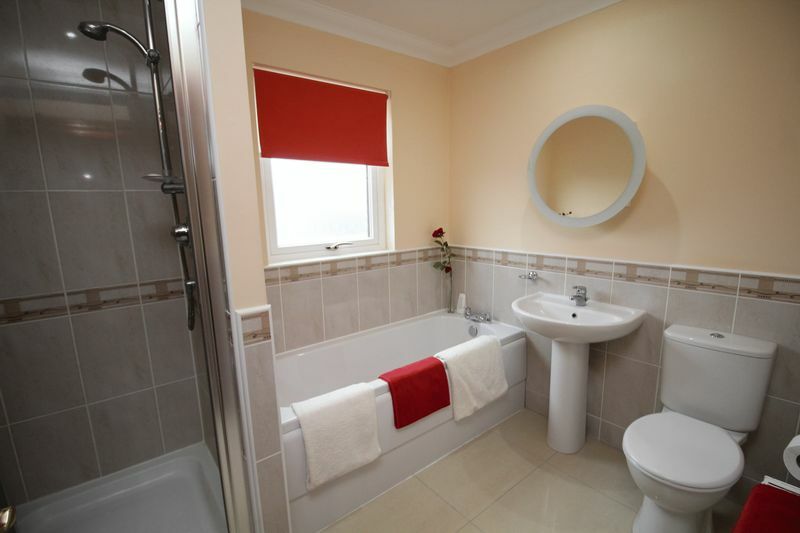 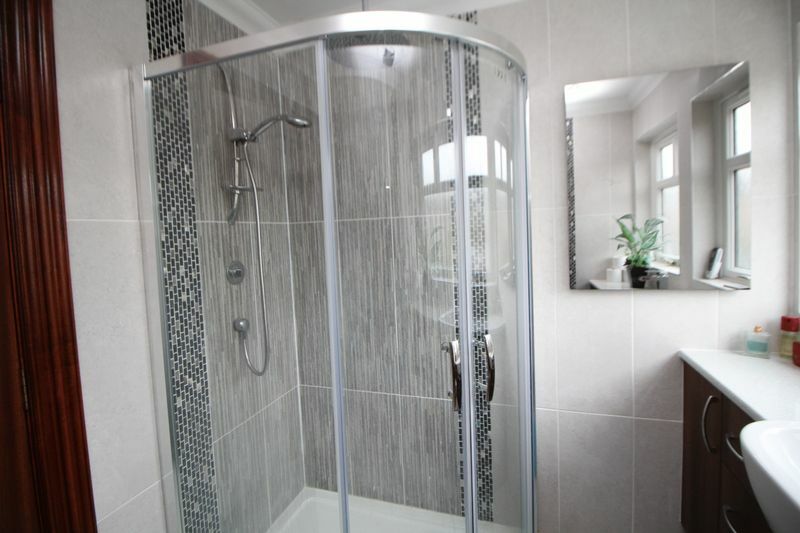 This fully tiled en suite shower room also has a door leading from the hallway and incorporates a low flush wc and wash hand basin within fitted bathroom furniture, and a shower cubicle with rain drop shower. 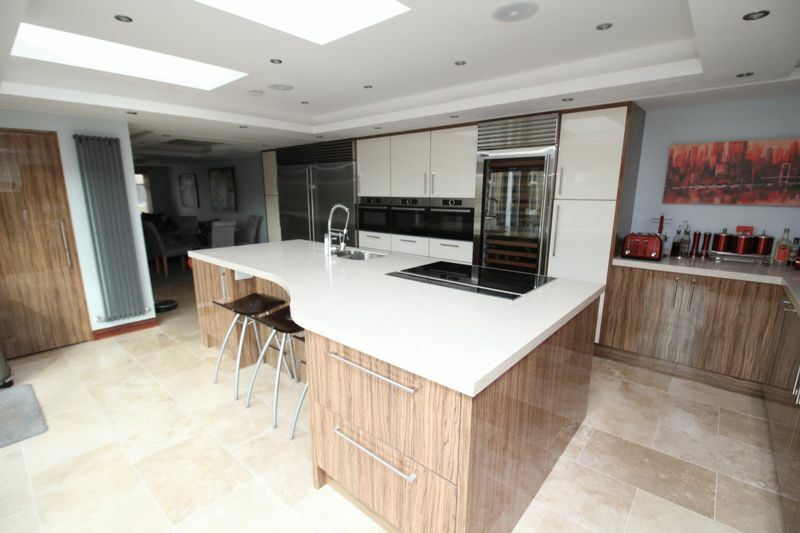 Tiled floor, LED down lighting, under floor heating, built-in sound system speakers and extractor fan. 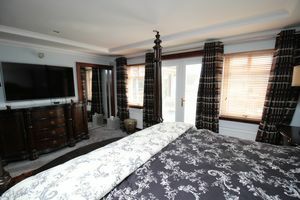 This bedroom features two front facing windows and four built-in double wardrobes, two with drawers below, to the dressing area. 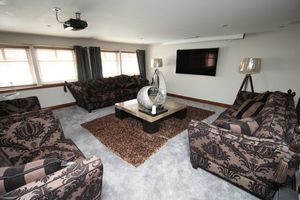 Fitted carpet, coved ceiling with light point and down LED down lighting, built-in sound system speakers, two radiators, tv point and ample power points, some with USB chargers. Doors leading into the hallway and through access to the dressing area. 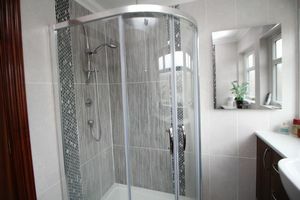 Doors leading into the hallway and en suite shower room. 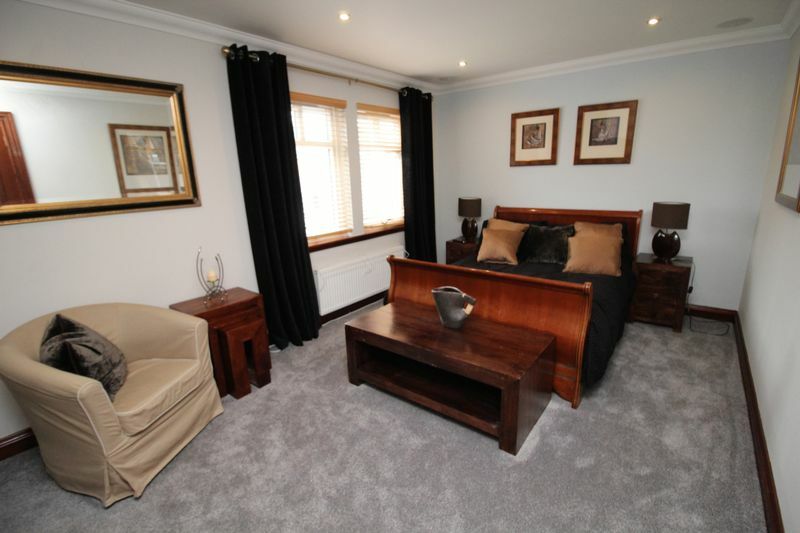 This bedroom features a rear facing window and a built-in double wardrobe. Fitted carpet, coved ceiling with LED down lighting, radiator and ample power points. 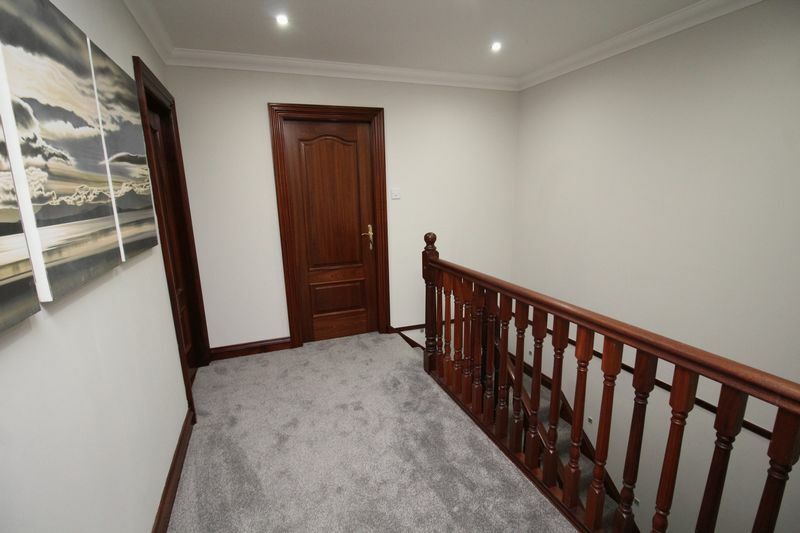 Door leading into the hallway. 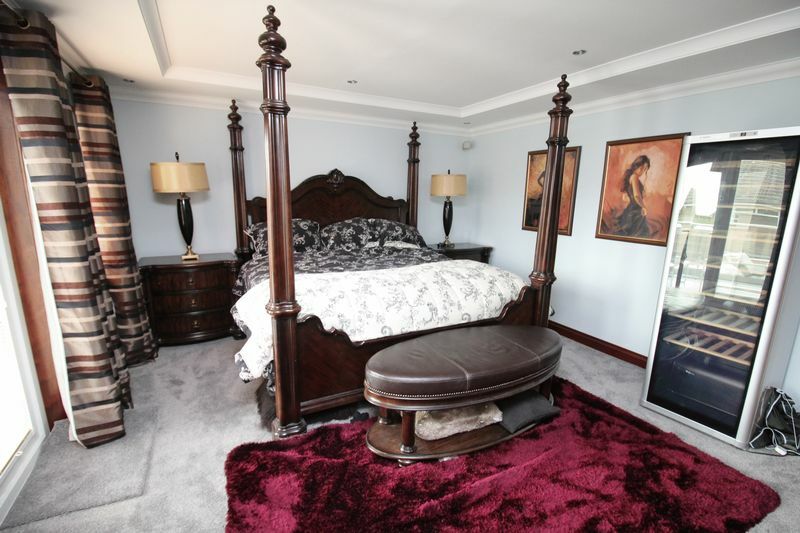 This bedroom features a rear facing window with roof top view to the Firth of Forth and a built-in single wardrobe. Fitted carpet, coved ceiling with light point, radiator and ample power points. 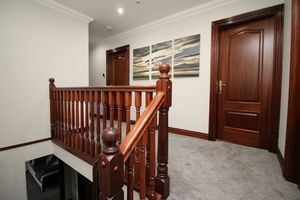 Door leading into the hallway. 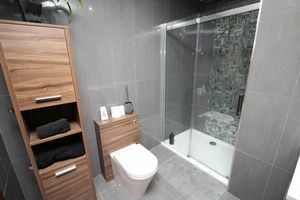 The partially tiled bathroom features a side facing opaque glazed window and incorporates a low flush wc, a wash hand basin, a bath and a shower cubicle. Tiled floor, coved ceiling with down lighting, radiator, extractor fan, wall mounted mirror and bathroom accessories. Door leading into the hallway. 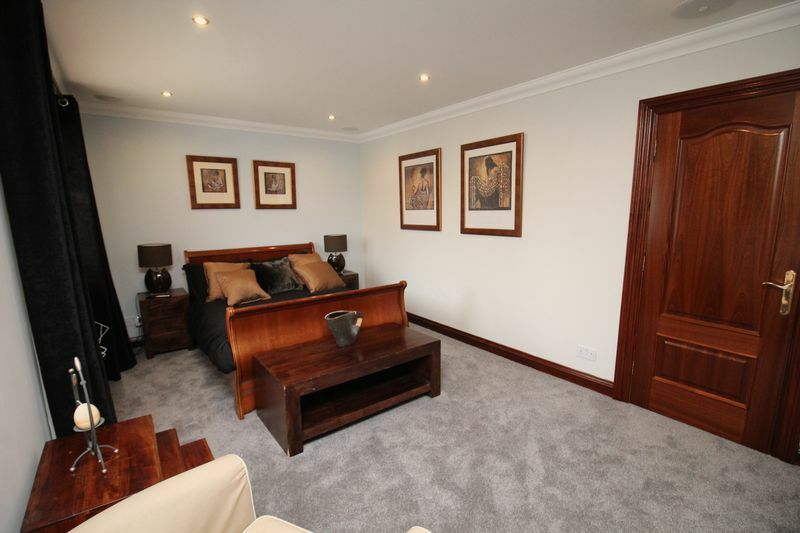 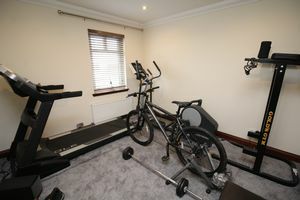 The heating is controllable in 4 zones – upstairs, dining/kitchen/family room, lounge and shower room downstairs. 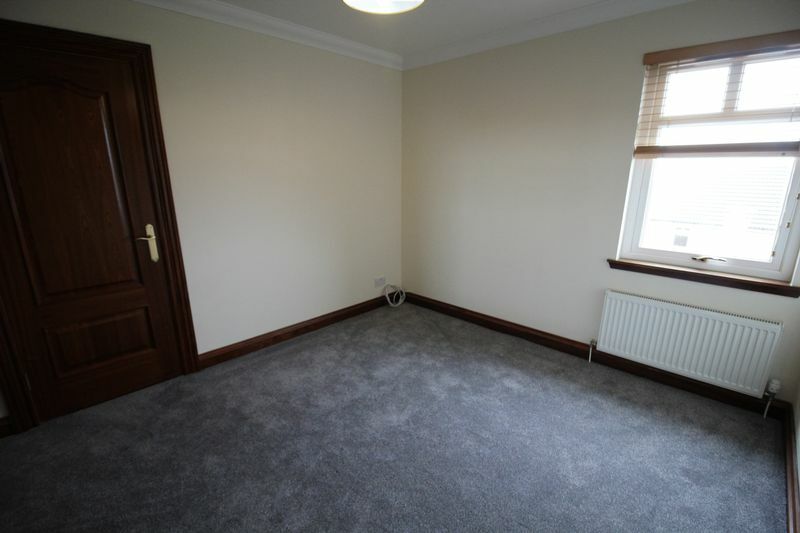 The house has been wired for cat6 communication. 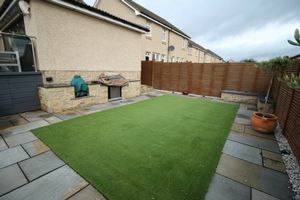 The front garden ground is laid to mono blocking for several vehicles, lawn, pathway to the right hand side allowing access around to the rear of the property and with external lighting and wood garden shed. 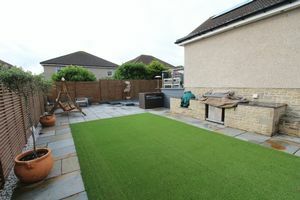 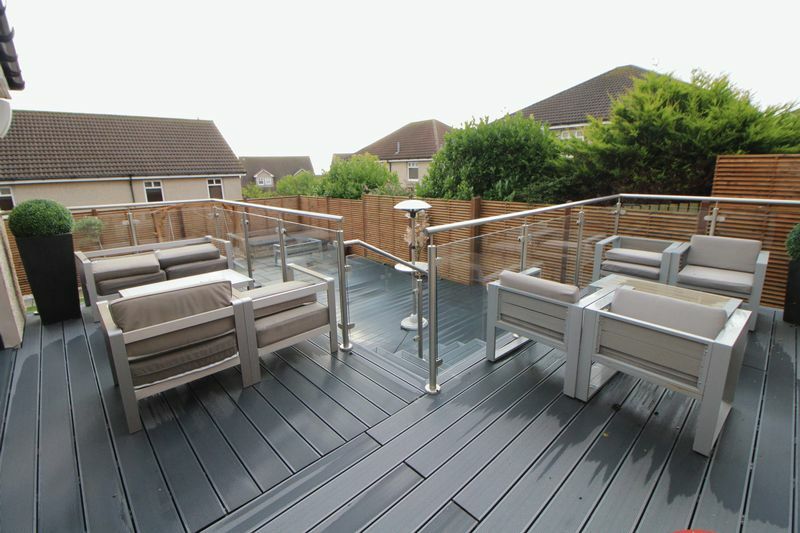 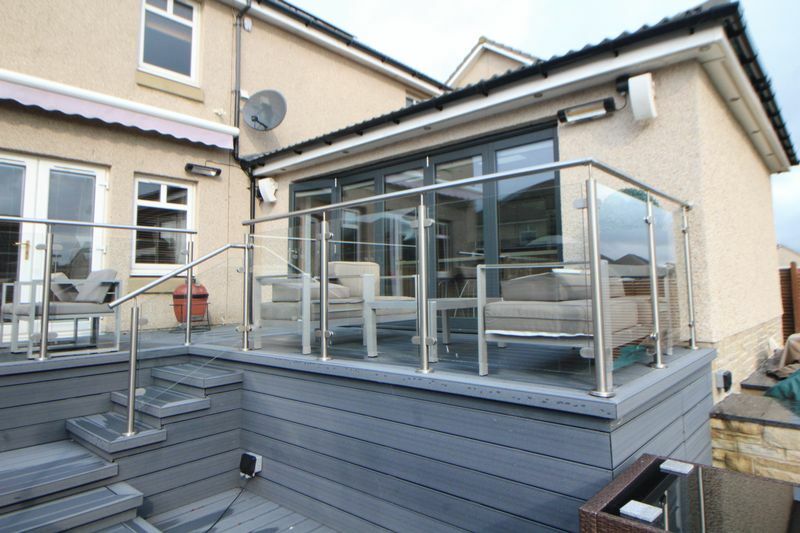 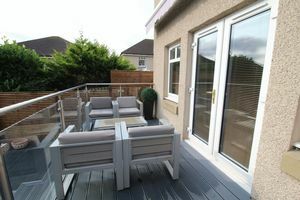 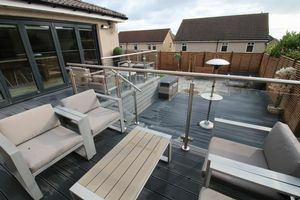 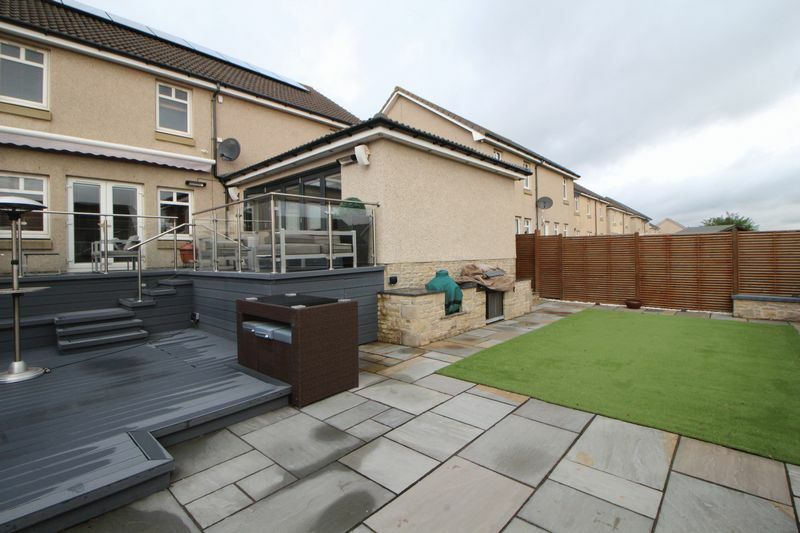 The rear garden ground is enclosed by wood fencing, is laid to two decked seating areas with glass/ chrome balustrade and awing, paved patio, fixed seating area, artificial lawn, and with external lighting and electric heater. Floor coverings, window blinds, three built-in Bosch ovens and induction hob with Neff downdraft extractor fan, built-in Sub Zero 36” each fridge and freezer, Sub Zero dual zone 146 bottle wine chiller washing machine and dishwasher, wood garden shed. NB – the surround sound system and tv’s are for sale by private negotiation.